Over the last three decades, the industry has repeatedly declared propeller guards do not work, cannot work, and will never work. A collection of some of those statements is below. If anyone even ever slightly leaves the door open, they immediately try to close it, and in the very rare instances when an industry representative makes a statement about the usefulness of guards, they are quickly reprimanded and brought back into the fold. This page also covers a few of those instances. James M. Pree v. Brunswick Corporation. Jury Trial. September 20, 1991. St. Louis Missouri. Richard Synder testimony. Jury Trial Volume 5. Page 166. Question – And you’re a mechanical engineer of lots of years of training. Question – Who is unable for his company to conceive a propeller guard that will work, correct? Answer – Yes. Myself and, as far as I can see, anyone else in the world since anyone ever tried thinking about prop guards has not conceived any idea, either. Question – That’s 18 years ago. And since you originally developed it you haven’t spent any – you haven’t done anything to significantly refine or improve that design, is that correct? Answer – That’s right. I haven’t thought of anything nor has there been any potential use of it. Question – And Mercury Marine hasn’t done anything to try to improve on that design, have they, as far as you know? Answer – I’m not aware of anyone else at Mercury that has worked in that – in the area specifically of a cage guard. Question – And Mercury Marine has not made any efforts to work on those guards and try to refine the design or improve them, have they. Answer – Other than thinking about it. I don’t recall anything specific about making hardware to refine it because nothing has been thought of that would be worthy to do. … at the end of the second paragraph, you say, ” – – – in a scenario we refer to as the “circle of death”.” To the best of my recollection the expression was first used by plaintiff’s expert, Robert Swint, back in the earliest prop guard law suits in the ’80s. The defense (The Recreational Boating Industry) objected to the plaintiff’s using that expression as “inflammatory”. They didn’t want the jury to here (sic) it. Some judges agreed and would not allow its use in court. So, when you say “we”, are you referring just to the USCG, plaintiff’s lawyers, and plaintiff’s experts? Because, many industry people consider it offensive. Joe Pomeroy, Lead Counsel for Mercury Marine in an article titled, Lawyer Sees No Avalanche of Prop Guard Lawsuits, by Jim Flannery. Soundings Trade Only. January 2003. Pages 12-13. Letter to CBS News, Erin Moriarity, New York NY. August 30, 1989 from Laurin Baker. OMC Director of Public Affairs. In response to an upcoming August 31, 1989 CBS This Morning segment. Calling Out the Guard. Sheryl James. St. Petersburg Times Floridian. September 4, 1989. Pages D1 and D3. Audrey Decker and Frederick Decker vs. 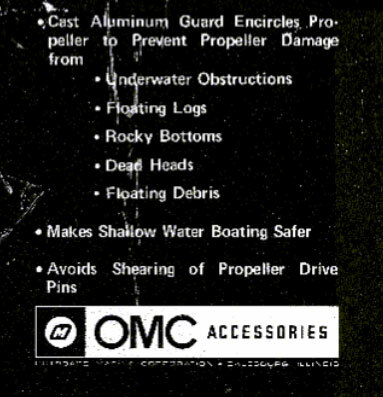 Outboard Marine Corporation. Circuit Court of the 20th Judicial Circuit in and for Collier County Florida. Exhibit 269.This reference discusses an unsigned and undated document, purported to be a position statement on propeller guards written in 1977 by OMC legal representatives. The statement is below. “These are people problems, not equipment problems, and should be addressed at their source, without burdening manufacturers and consumers with expensive and cumbersome devices that make recreational boats less safe than they are today. After a series of local propeller accidents and a fatal propeller accident involving a young girl, the Orlando Sentinel (Florida) interviewed several parties on propeller guards and published a story on 7 September 1987 titled, Propellers Are a Deadly Problem. Among those interviewed was David Beach, Manager of Engineering Services for the National Marine Manufacturers Association. Mr. Beach finished by citing USCG Event 1 only propeller fatality statistics for 1986 (16 deaths) and falsely claimed they represented all deaths that year. Event 1 statistics (first event of the accident sequence) only represent a small fraction of USCG reported propeller accidents or fatalities in a given year. In March 2002, NMMA responded to a USCG request for public comment on a proposed propeller safety regulation for houseboats with call to arms encouraging its members to write USCG and expound the list of points they presented. CHICAGO, March 22, 2002 – – The United States Coast Guard has extended the deadline for submitting comment on a proposal regarding mandatory propeller protection devices on houseboats until May. National Marine Manufacturers Association (NMMA) is taking advantage of the extra time to issue an action alert to members of the recreational marine industry to voice their objections to the proposal. The proposal requires owners who lease, rent, or charter non-planing recreational houseboats to install either a jet drive system, propeller guards or three combined measures. The three combined measures include installing swim ladder interlocks, a clear visibility aft device, and an ignition cut-off switch. Owners of non-planing, non-rental houseboats would be required to install the interlocks and the clear visibility aft device, but not the ignition cutoff switch. John Mcknight, NMMA director of Environmental & Safety Compliance, says that this proposal is not only about houseboats, but about engines as well, and in the future it could spread to all types of boats. “NMMA clearly supports steps to reduce boating accidents and fatalities, but this proposal raises the question as to whether in this case the risk justifies the cost of regulation,” says Mcknight. McKnight points to statistics that the USCG bases the need for this rule on. From 1990 to 1999, there were a total of 18 propeller-related injuries and two deaths. The proposal estimates the total cost to rental operations to upgrade each boat would be $440; costs NMMA believes are underestimated. NMMA is making it easy for the industry to voice their objections. A sample letter opposing the proposal can be accessed on NMMA’s website at www.nmma.org. On the site, click on “Making Waves” and follow the steps to send an industry letter. “Based on the volume of responses the USCG has currently received, the recreational marine industry is outnumbered five to one by those in favor of propeller protection devices. The industry has to make their voice heard before it’s too late,” says Kelly Bobek, NMMA director of Federal Government Relations. For more information on the prop guard proposal, contact McKnight at (202) 721-1604; jmcknight@nmma.org. John McKnight, NMMA Director of Environmental Compliance and Safety responded to the recently released U.S. Coast Guard & ABYC Propeller Guard Test Procedure. He responded it in an interview published in a September 16, 2013 Soundings Trade Only post titled, “ABYC and Coast Guard Join on Propeller Guard Test”. NBSAC is a U.S. Coast Guard Advisory Group that is sometimes dominated by industry representatives. In 1988, in response to a number of propeller accidents, a NBSAC subcommittee was formed to investigate the feasibility of propeller guards. They issued a final report in 1989. It was strongly opposed to the use of propeller guards as seen in the quote below from page 24 of the report. OMC put the following statements in the installation kit with their small ring guard years ago, to indicate it was not for protecting people. Question – For a very limited purpose you testified that your guard will work for the purpose that the Marine Corps wanted it to, is that correct? Answer – I believe it will be an effective device for the very low speed activities on these Marine Corps boats, yes sir. Question – Okay. Well, you would not have sent it to the Marine Corps for use if you didn’t believe that, would you. Richard Synder interview in Soundings Trade Only, July 1996 article titled, ” Emilio’s Mom Revives Prop Guard Debate”. Richard Snyder 2002 letter against proposed houseboat propeller safety regulations. Mercury Marine letter to USCG dated 26 February 2002. USCG Docket Item # USCG-2001-10163-106. Page 4. Robert Leroy Ard v. Brunswick Corporation. Trial Transcript. Richard Snyder testimony 25 April 2006 Pages 203-204. Question – Would you tell us again when you think those (referring to propeller guards) are appropriate? Answer – Generally whenver you’ve got something that is dedicated, slow-moving operation, and that can be such as rescue boats that are dedicated to rescue. Of course, little family, boat operations, often called bumper boats, they’ve had them as long as I’ve ever seen them. There can be military operations like we talked about where the boat is slowed down to nearly no velocity and there is training of people getting off and getting on in possibly very rough water. That is excellent use of something like that. It would make sense to me if you had slow-moving, big houseboats that went 5 or 6 miles and hour and were not not areas where they would hit the bottom or run into weeds, that could be a decent application of some form of guard. Robert Leroy Ard v. Brunswick Corporation. Trial Transcript. Richard Snyder testimony 25 April 2006 Page 239. Question – All right. (refering to an old Mercury test) So this is a 1973 test by Mercury on a guard where there was no particular problem with the steering in this particular test, correct? Answer – Under these circumstances, yes. Question – And the performance deficit was from 16.5 to 15.1 (miles per hour) correct? Answer – Right, and since you said you wouldn’t cut me off, this is a small, seven-and-a-half-horse fishing outboard, another small boat that only goes 15, 16 miles an hour, and I told you before that at speeds that low, drag differences are minimal and this in fact — This is partly why it was being done, was to let it serve as a pipefitting ring to help acceleration. It served that purpose and at these low speeds there aren’t any problems like that. Robert Leroy Ard v. Brunswick Corporation. Trial Transcript. Richard Snyder testimony 25,26,27 April 2006 Page 275. Question – Thank you. Now you agree that if the boat involved had had a cage guard on it and the wires were close enough together that Mr. Ard would still have his leg? Question – And do you agree that there are many instances where a propeller guard would have prevented injury of passengers or water skiers? Question – Do you agree that almost all low-speed injuries could be prevented by a decent cage guard? Answer – As long as you qualify with a decent cage guard by my definition, yes. Question – And there is no question in your mind that back in 1973 a cage guard which did not cause dangerous steering characteristics and which would have prevented against this kind of injury could have been manufactured by Brunswick? Robert Leroy Ard v. Brunswick Corporation. Trial Transcript. Richard Snyder testimony 25,26,27 April 2006 Page 279. Question – In 1987 if you had been asked to develop a guard that would protect people at 5 to 10 miles per hour, would you have any problems developing such a guard from an engineering standpoint? Answer – I don’t — I don’t think there’s any problem in developing a guard that would be ANSI correct and would function at 5 or 10 miles an hour. OMC Australia saw the market for guards on the local surf saving life boats. 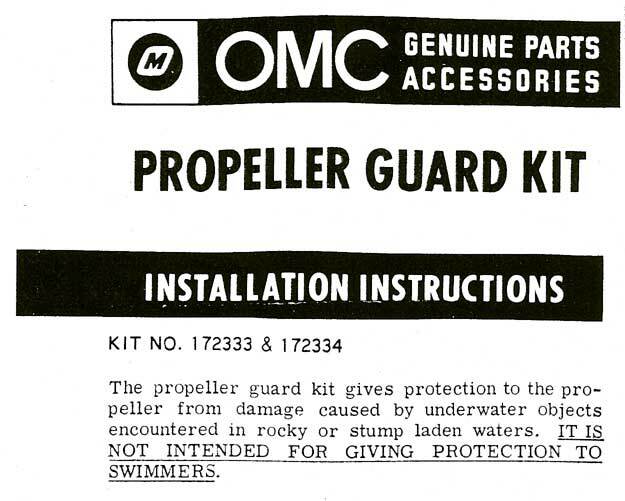 OMC was already selling the ring guard for small outboards under the guise of protecting the propeller. OMC Australia teamed with a local manufacturer to build a companion “face mask” for the ring and started selling the combo guards like hot cakes. Then they made the mistake of bragging about their invention to the folks back in the USA in a faxed letter dated September 19, 1977. That particular issue focused on the launch of FICHT technology. We suspect all their editors were too focused on all the hoopala surrounding FICHT to catch the prop guard statement. … The guards are fitted to minimize injury when a “patient” is alongside. It is quite obvious the “official memo” was written to try to cover themselves from some of their earlier braggadocious statements about the guard. Yamaha U.K. got caught in this same trap in 2012 with their flood rescue outboard guard. 2012 found Yamaha U.K. heaping accolades upon their stainless steel flood rescue outboard propeller guard. In October 2012 we published three posts about their new guard and included some of their statements. By early November all references to Yamaha’s new prop guard had been erased from the Internet. Sound familiar to the OMC S.L.S.A. guard situation? We later republished Yamaha U.K.’s actual documents. We asked the USCG Office of Boating Safety to ask Yamaha what was going on since they would not respond to us. USCG later reported Yamaha said they just had a customer that wanted to buy some outboards with some guard so they bought some and put them on. Kind of odd that all the literature was published after they delivered the flood rescue outboards to Lincolnshire and then vanished shortly after our coverage of it. They did not provide an explanation for that.